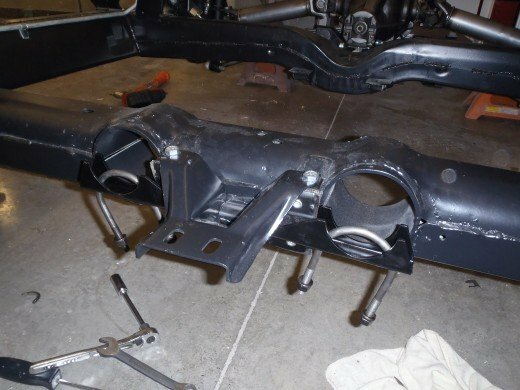 We are still continuing to grind through on our 1963 Corvette chassis assembly. 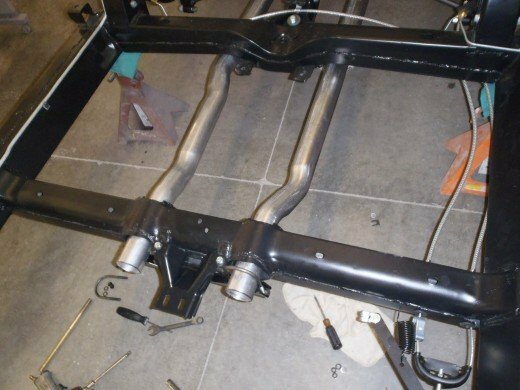 A major contribution to our chassis assembly at this point has been the addition of the Corvette Exhaust system. 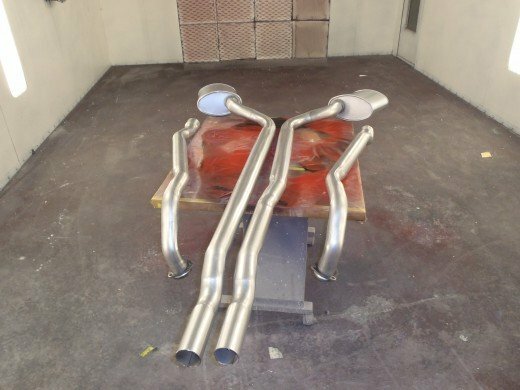 The corvette exhaust is unfortunately something that an original can’t really be restored and the reproductions are not quite like the original, so you are pretty much forced to take a standard point deduct. That being said, you still have to make it look as original as possible which involves some painting of the exhaust. 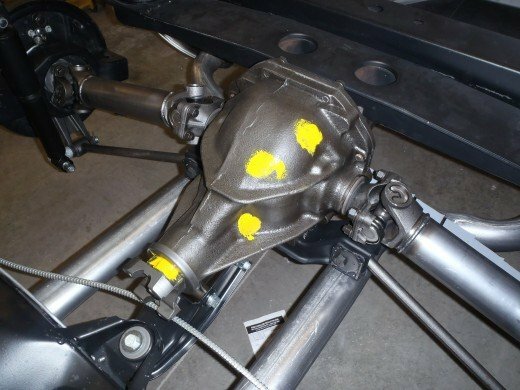 In addition to partially getting the Corvette exhaust installed, we assembled the parking brake linkage and installed the transmission mount. We got the parking brake cables installed and secured to the frame. 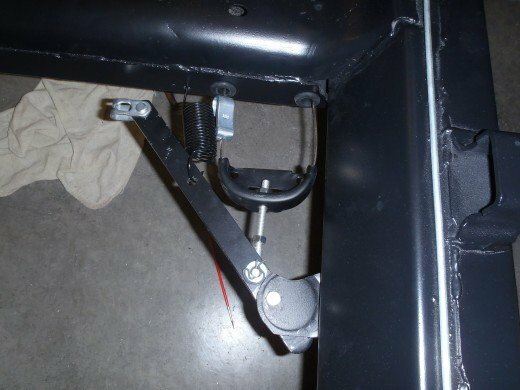 We refinished some of the original parking brake hardware and installed the linkage. Here is the Corvette exhaust system. This is a reproduction system as received. 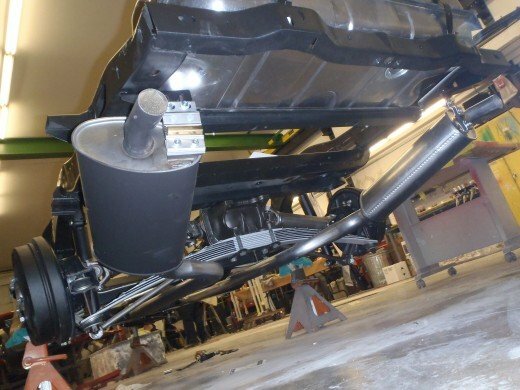 We laid out the exhaust upside down, as you would see it from the underside of the car. We painted only the top (technically the bottom) of the exhaust black. If your looking at the photo, the black is a flat black, it is still glossy from being fresh. 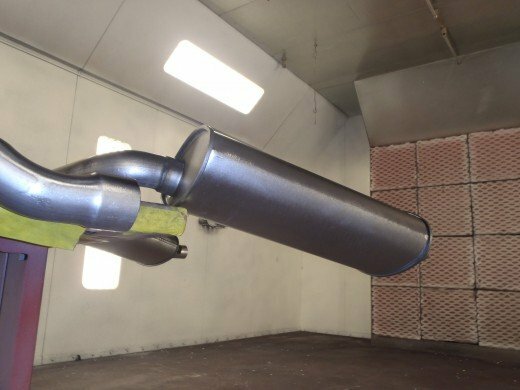 Here is the muffler side of the Corvette exhaust after paint. Here you can see the paint is only on the one side of the exhaust. 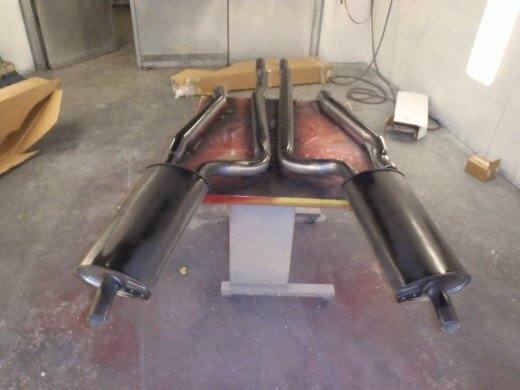 The reason the exhaust is painted like this is because the chassis was assembled upside down and some black out was sprayed on the exhaust. Here is the center transmission mount installed on the frame. Underneath of it is the center exhaust mount. This exhaust mount was a one year only design. Here is the exhaust installed on the chassis. In this photo you can see that the exhaust does not have any paint on the top side of it. 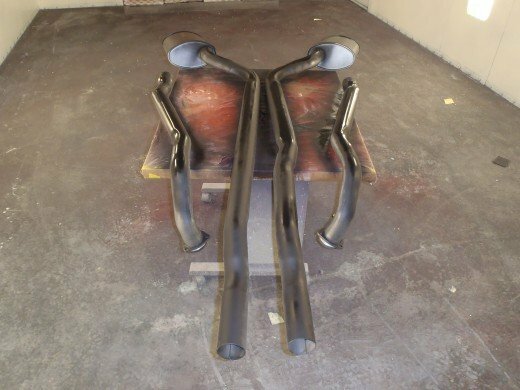 Also, we will leave the front section of the exhaust out of the chassis until we install the engine and transmission. After finishing up the exhaust install, we decided to go ahead and get the assembly marks on our differential. At this point we need to get our engine assembled and mate it to our transmission, then we can install it in the chassis. 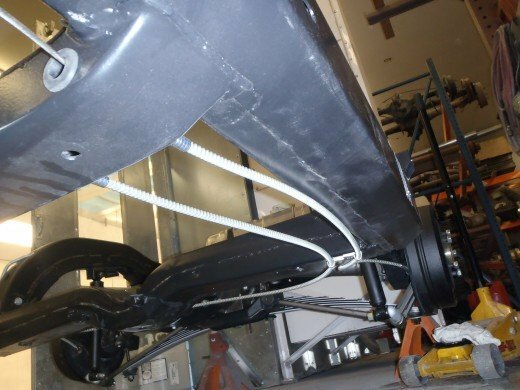 After that there is a few loose ends to tie up and then the chassis is ready for the body to be installed.